This is a tutorial for cousins on Ancestry to make sure they can find our common ancestors. I've borrowed screen shots and made them anonymous, just to show the screens one sees when signing on to Ancestry. 2. 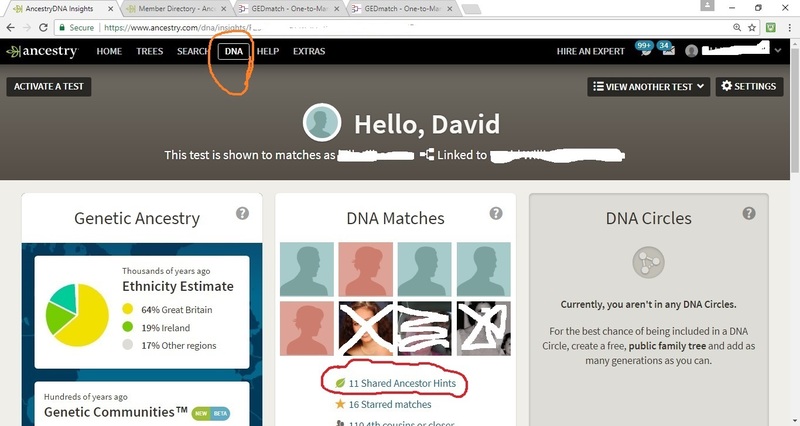 Click on DNA at the top of the page to go to your matches instead of your family tree. 3. 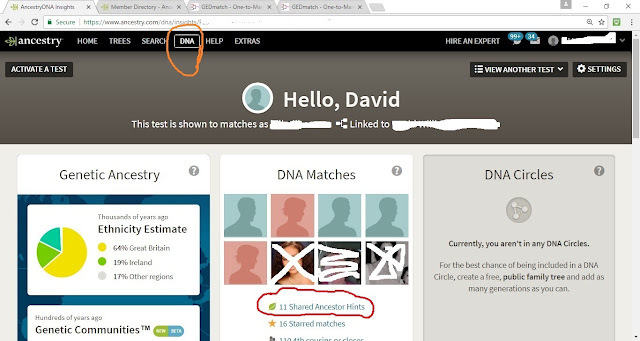 I have outlined in the previous picture (see "11 Shared Ancestor Hints") in red the next place to click. This takes you to a list of shared matches that doesn't look much different to the general list, except that every match has one of those waving green leaves by it. 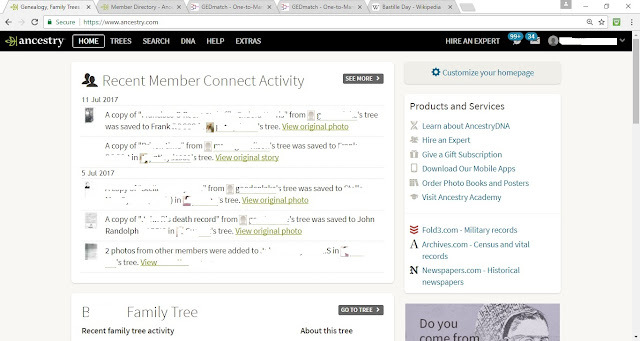 A shortcut to this page is to click on the Filter for [green leaf] HINTS. 4. 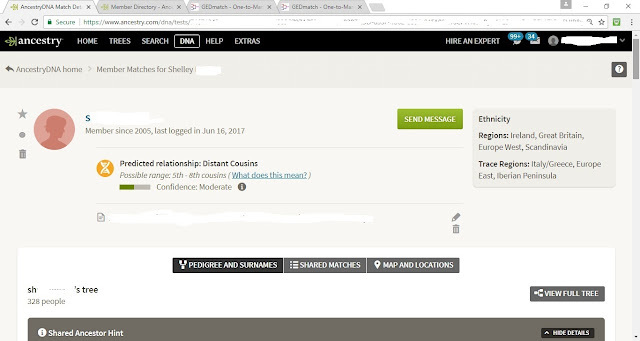 Click on the shared match (View Match) you're interested in (Which is this example is Shelley BXXXXX (managed by billxxxxxxxxx) (in his dreams). 6. Make a note of the name or names at the top of the chart, our common ancestor(s). 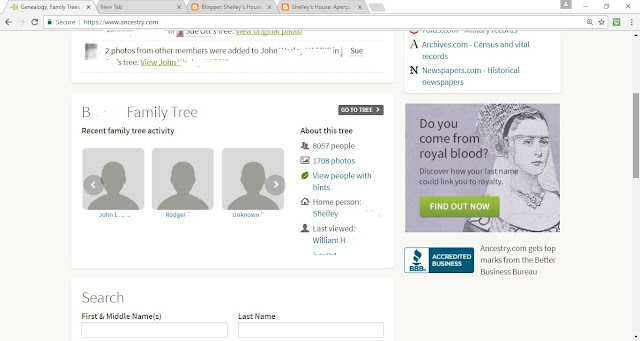 And, if you don't mind, the name of that person's child at the top of your column. This example shows that my Bernard had a brother named John and their parents were Patrick J and Sarah. 7. Note the relationship by my name which will be on the right hand side opposite yours. 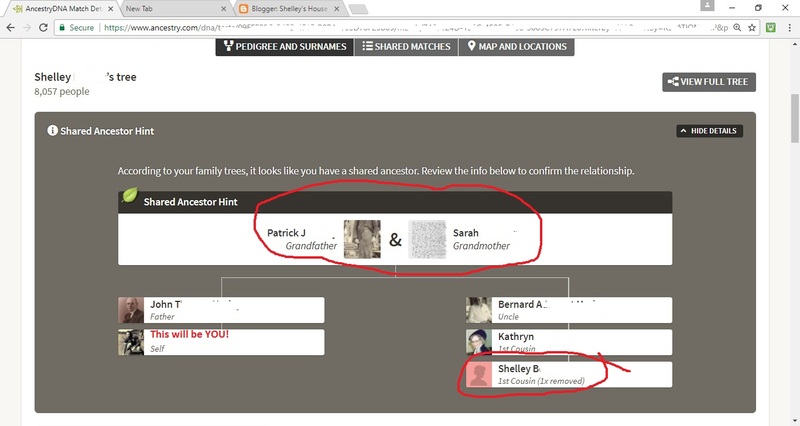 It might be something like 6th cousin (once removed); and if so of course the list of names would be much longer than pictured above, which is a closer relationship. 8. 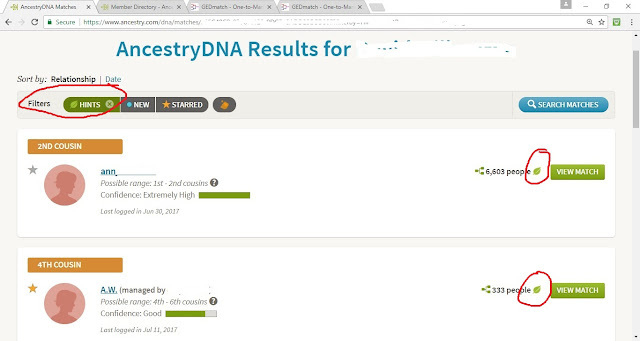 Please send me a message on Ancestry (or comment here it is easier) to tell me who is our common ancestor!